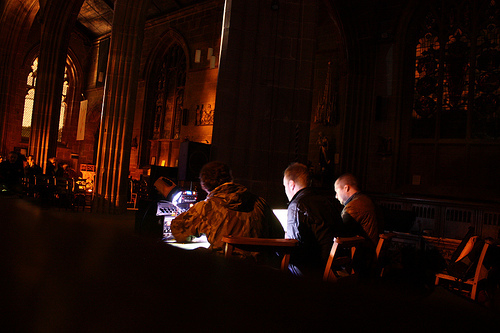 In September 09 Modulate performed at A Thing About Machines festival in Coventry, in the historic setting of St John’s Church on Spoon Street. 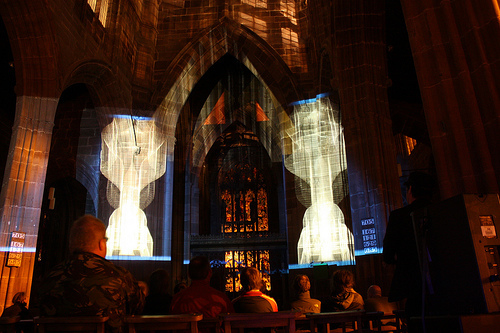 The three Modulate music makers ( Bobby, Mark and Mark) performed from the front of the church while Joseph and I had the pleasure of projecting our visuals onto the architecture from the back of the church. It was a great to have the opportunity to perform in such a special setting, and a pleasure to be a part of this unique festival, now in its second year. What a shame that the Arts Council did not support ATM this year, despite the success of last years festival and the great line up this year – but well done to Cormac for continuing regardless. Lets hope they give more support where its due in future .